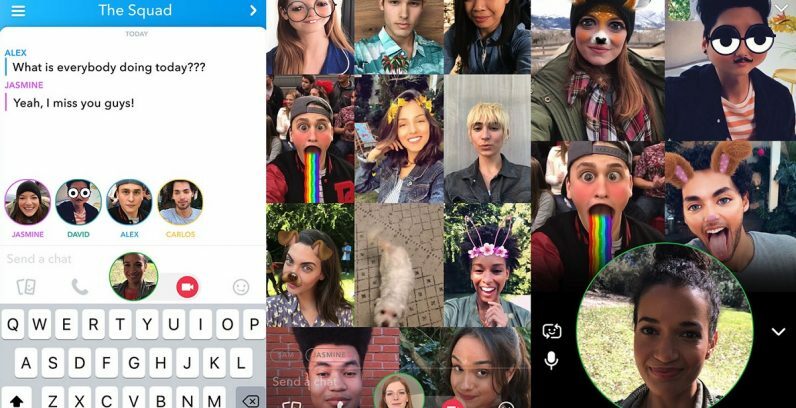 Snapchat today announced it was bringing two new features to the app which boost its credibility as a social experience: Group Video Calls and Mentions. Group Video Calls function about the way you’d expect. When you’re part of a group, you tap the video icon to start a video call. Everyone in the group will get a notification telling them the call has begun, and they have the option of joining or not. They can also opt to join in voice only. Up to 16 people can join a group video call with cameras on, an impressive number compared with Messenger’s 6 and Google Hangout’s 10. The number goes up to 32 if some of your friends are willing to go voice only. As is usual with Snapchat, you can use Lenses to during the call to give yourself dog faces. Users can now also Mention their friends in their Snaps. To do so, use the customary @, then type out their username. The friend will be notified if they’ve been tagged. If curious Story viewers want to know more about the person tagged, they can swipe up and see that user’s Story. Both of those features go a long way towards closing the gap between Snapchat and more social-oriented apps like Facebook — and goodness knows now’s the time to look for a social media app that’s not Facebook. Mentions and group video calls will be rolling out to everyone over the next few weeks.